Villa Sancti Malibu, where Tuscany meets Alice In Wonderland! Villa Sancti Malibu is an incredibly gorgeous Southern California Estate Wedding Venue. When you step onto the private Malibu Estate property you will feel like you’ve been instantly transported to a Tuscan vacation in the whimsical and perfectly manicured gardens of Alice In Wonderland. Villa Sancti Di Bella Vista is a Tuscan Estate located in one of the most beautiful parts of Malibu. You might also feel like you are in the South of France because this venue has spectacular ocean views, landscaped gardens, and a vineyard. The sprawling 2-acre garden estate is the perfect blend of nature, luxury, and serenity, with strong dash of whimsy! Read on to see my full Art & Soul Events ® Villa Sancti Malibu tour that I went on with an incredible photographer (and friend), Brett Loie of Loie Photography! Her photos are absolutely gorgeous! At Art & Soul Events ®, we are always looking for incredible hidden gem venues in Los Angeles, Southern California, and Beyond! We don’t shy away from a challenge, in fact, our specialty is planning and designing custom weddings with complicated logistics. Villa Sancti Malibu is an estate property nestled in a private residential Malibu neighborhood. It essentially a raw space and everything will need to be brought in. So if you want to hire an event planner and designer to manage these complex logistics, we have your back! RENTAL FEES: 2019 Estate Rental fees range from $10,000 (under 100 guests), $12,000 (100-149 guests), $15,000 (150-199 guests) up to $18,000 (200+ guests) depending on your guest count. VILLA SANCTI SITE REP: Is already included in the site rental fee. VENUE ACCESS HOURS: 8:00 am until 12:00 am. See sound specifics below. MUSIC/ SOUND ORDINANCE: The sound ordinance is controlled by the City of Malibu and must be off by 10:00 pm on Friday and Saturday and off by 9:00 pm, Sunday through Thursday. Bands and DJs are okay, but the sound levels must comply with local noise ordinances. EXCLUSIVE CATERER: Contemporary Catering is the exclusive caterer for Villa Sancti. They are a full-service catering company with a commitment to using quality, locally and sustainably sourced produce, meat, and poultry. EXCLUSIVE RENTAL COMPANY: Premiere Party Rents. All furniture, bar, tables, chairs, specialty lighting, and tabletop rentals must be brought in by the client and rented from Premiere Party Rents. PORTABLE RESTROOMS: Portable Restrooms must be rented and brought in (not included in the site rental fee). GENERATORS: The venue provides two generators included in the site rental fee. SHUTTLE & LOT RENTAL: MARS is their exclusive shuttle company. Guests must park in an off-site church lot (rented by the client) and be shuttled to the property. PROPERTY ACCESS: There is a getting ready suite inside the house for the couple to use, but event guests won’t have access to the house. SECURITY: The clients are required to hire security for their event. CLEANING & TRASH REMOVAL: Cleaning and trash removal is included in the site rental fee. Beautifully captured by the mega-talented, Brett Loie, of Loie Photography! DO YOU NEED HELP PLANNING & DESIGNING YOUR WEDDING OR FINDING THE PERFECT SO CAL EVENT VENUE? To see more Art & Soul Events® - Favorite Malibu WEDDING Venues, click here: The Lodge at Malibou Lake or “Camp Cabernet” at Saddlerock Ranch. There we were at sunset, a handful of badass creative women, standing at the top of a beautiful scenic mountain overlook, creating ART together. It was a MAGICAL moment and I cried! 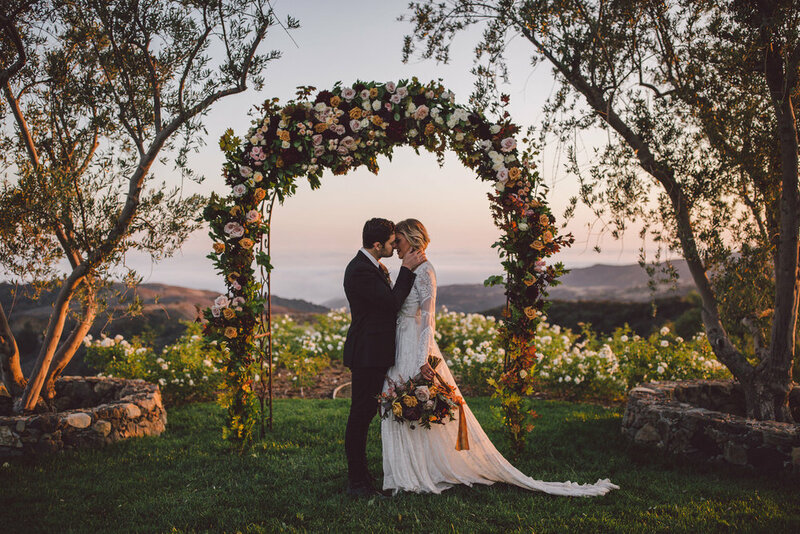 Read on to see Evangeline Lane’s dreamy sunset portraits from our “Wild Bohemian" Wedding Editorial.